Thanks so much to our generous companies, Namaste, Soak, Hiya Hiya and Noni Designs for those wonderful fall prizes! I also want to thank everyone who commented; your favorite fall colors really got me inspired! I was hopping up from my chair and running down to the Evil Lair to mix up new shades based on your ideas. In fact, you inspired me so much that I’ve added not one, not two, but 11 extra prizes of my Milwaukee Slouchy Beret pattern to 11 additional winners as a thanks for sharing your ideas! 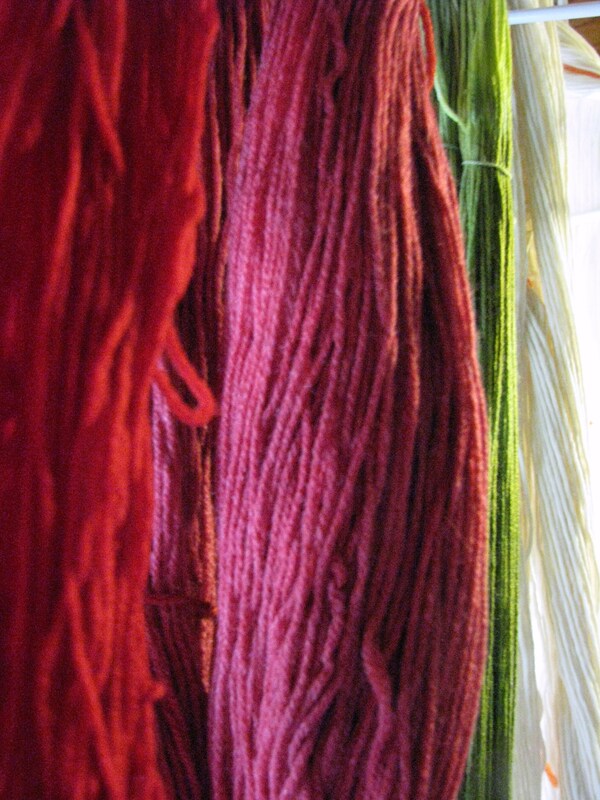 The color of the Rocky Mountain Dyeworks yarn is called Maple Leaves, btw. See the bottom of the post for winners. Your comments proved again what an fascinating bunch we knitters are, and what a wonderful group for the Knitcircus blog! I loved hearing about everyone’s projects and inspiration. So many of you left noteworthy comments and I’ve pulled out a few of my favorites to share with everyone who might not have gotten a chance to read them. Hunnyb sums up the way many of us feel: Mmmm, I love pumpkin oranges, deep plums, chocolatey browns, and reds. And Cathy brings up many of your favorites: I am loving the lovely jewel tones for fall: Emerald green, Sapphire blue, deep Garnet red. I love knitting in the fall! Savannagal says:My favorite fall colors are the earth tones. Burnt orange, golden tuscan yellow, all of the greens, rusty browns and dark earthy browns, and the lovely deep, rich reds. Stephanie adds: I love to knit with deep ocean blues (year round) and have really been gravitating toward oranges and deep yellows this fall! Linda speaks for the quieter tones:I love knitting with creams, browns and greys – natural yarn colours – for Autumn. But then again, a bright splash of red or blue can cheer up a cold, windy day. Shades of purple-red are many of our top picks: Kristin G:My favorite fall color is burgundy. But last night I was looking at fabric. It was my absolute fave shade and the name was ‘Port Wine’. I love that and now will use it to describe my fave color!! 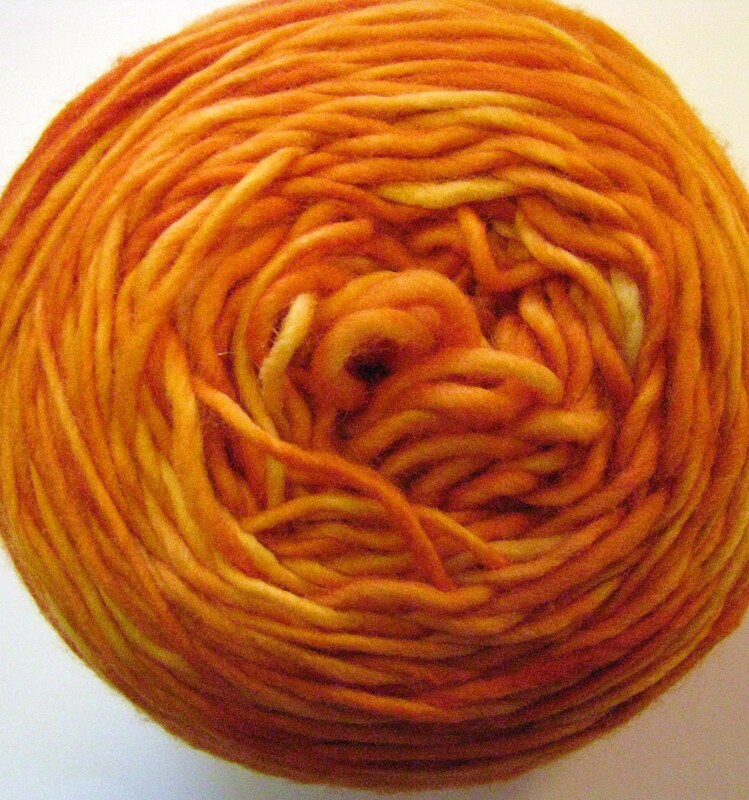 And Danica agreed with a huge group of people when she said: My favourite fall yarn colours are of course – ORANGE. All the shades of it! Some people just wrote beautiful comments! Tami: My favorite fall colors I’d have to say , a Crisp Apple Red, *My favorite*, a brown the color of pumpkin pie, white or cream,*like a dollap of whipped cream* , and a Light moss green the color of the grass right as fall turns into winter ! For a mixed color, I’d choose the colors of a tree in Vermont that changes it’s leaves in fall, the red, pinky orange,orange,yellow,brown colors. so pretty ! Emvious:My favorite fall colors are rusty oranges, deep browns, and then anything that brings a pop of color into the rather brown and dead looking exterior out here in Colorado. Once the leaves go from the aspens there really isn’t a whole lot left until spring. Karamel:I love the warm fall colors of pumpkin, cocoa, and a forest green. Something about these shades put me in the mood for warm apple cider and cool fall days. Bethe Says:I love this time of year! Nature provides the most beautiful colors, children gather to learn, we start to move indoors, where we cook and bake and Knit! Carol:I love the maroons and pinkish maroons often seen in maple leaves. I love fall! Heather:I love the bright golden yellow of my neighbor’s sugar maple tree. 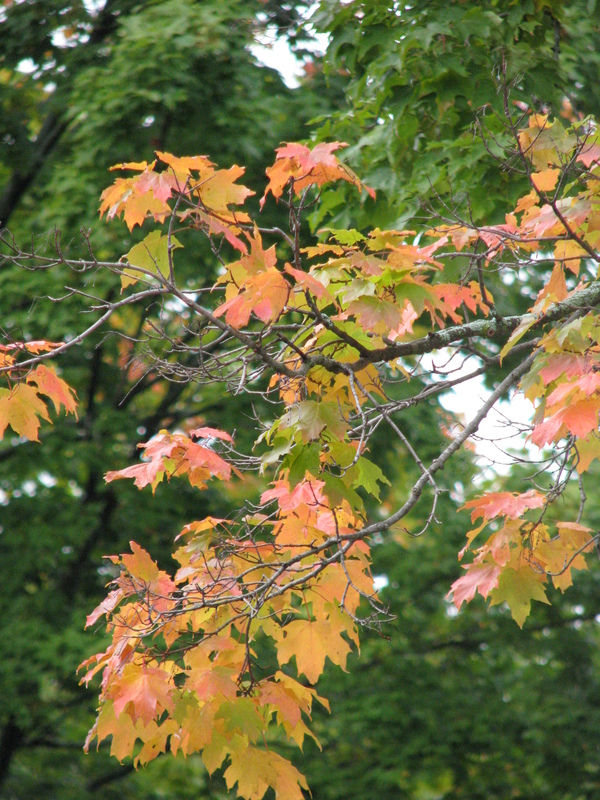 Our next-door maple is just starting…. Deb: Just one look at my stash and everyone knows I’m an “Autumn” and a New Englander. All the colors of a majestic sugar maple in Fall are my favorites! Jean:I lOVE the Rusts, Deep Maroons and Warm rich Browns of the Fall Oaks! Pharmgirl: My favourite autumn colour is tourquoise… The one that the autumn sky turns just after noon, when it knows that in a few short hours it will be black again. Morgen: I love the russet, maple sugar, and fading green of Autumn. Shermie: Yarn colors for fall for me must follow autumn leaves, including many shades of browns, pumpkins, cranberries and even piney greens, so often forgotten. 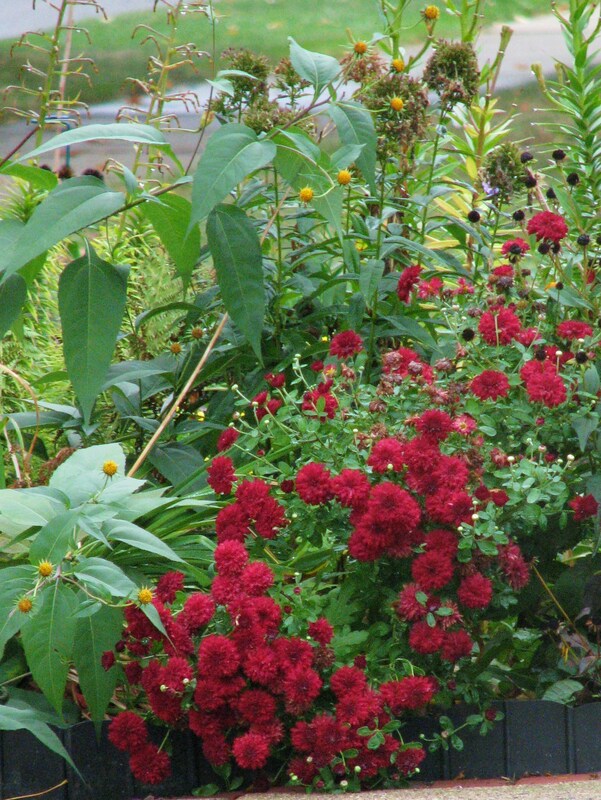 As the season progresses they merge into the deeper reds and holiday greens. Marie:Colors? I seem to have fallen into an unlikely rut. I put the latest shawl to be blocked on my mannequin to keep it out of the cat’s usual exploration range and discovered it’s just about the same rusty orange/brown as the shawl that was already on display. Then my new yarn arrived and I put it on my desk a few feet away – what do you know, same color! Believe me, not on purpose! 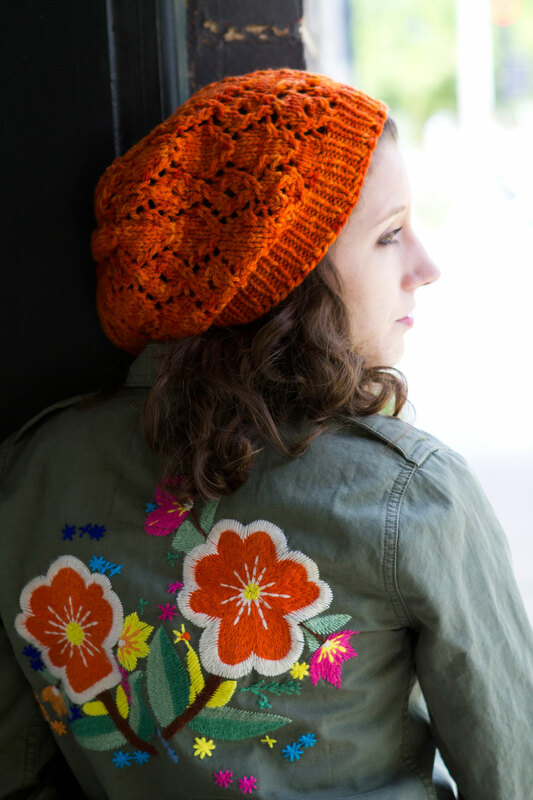 Rebecca: So many things to love about fall knitting, but color tops the list! Just started an espresso-colored sweater, am working on a deep green one, and have just finished sweaters in deep purple, taupe, and dark green. Every single one is my favorite! Can’t wait for sweater weather to hit the Northwest! And G.K. Green’s description was so exciting I had to try to create a yarn in these tones! G.K Green: My favorite fall yarn color is really a color combo … dark chocolate brown paired with a jolt of deepest magenta. It’s surprisingly striking, and a nice alternative to the tangerine/pumpkin spectrum showing up everywhere now. And Knitzombie said just how i’m feeling as a knitter right now: Life begins with fall, the colors, smells and gentle sounds of needles tapping with the wind. I am ready. Rose, Lisa, Koreakiwi,Terri Sue, Shannon M.,Judy, Carla, Debi, Candi, 16005Crofton, Lynnknits.